Hope? Change? Obama's Middle Finger! This is the astrological chart of Barack H Obama, quite possibly the most-analyzed chart of the past five years by Western astrologers. Astrologers, who for the most part are a left-wing cult, have gushed over how the Chosen One's elevated Neptune gives us all hope and spiritual inspiration, of how His Sixth House Sun makes him an ideal servant of the people, how His Saturn-Jupiter conjunction makes him the true arbiter of progress for the world, et cetera ad nauseum. All of the evil of the Obama administration could have been foreseen by anyone studying Obama's record as a United States Senator (Obama actually boasted of supporting virtually all of GW Bush's policies). It is also foreshadowed in his astrological chart. Like the earlier-profiled Bob Avakian, Obama also has Pallas in Pisces, co-ruled by Jupiter which is tightly parallel Pluto. Obama, however, lacks the Sun-Pallas conjunction which brings one's ethics, however mangled, to the forefront. Pallas is also considerably more compromised on Obama's chart than in Avakian's. Said Jupiter is not only parallel Pluto, but also biquintile Pluto. Pallas' other ruler, Neptune, is square Jupiter, sextile Pluto, and parallel with the South Node. While Avakian's ethics might be severely twisted, Obama's are... and his record as President proves this... nonexistent. 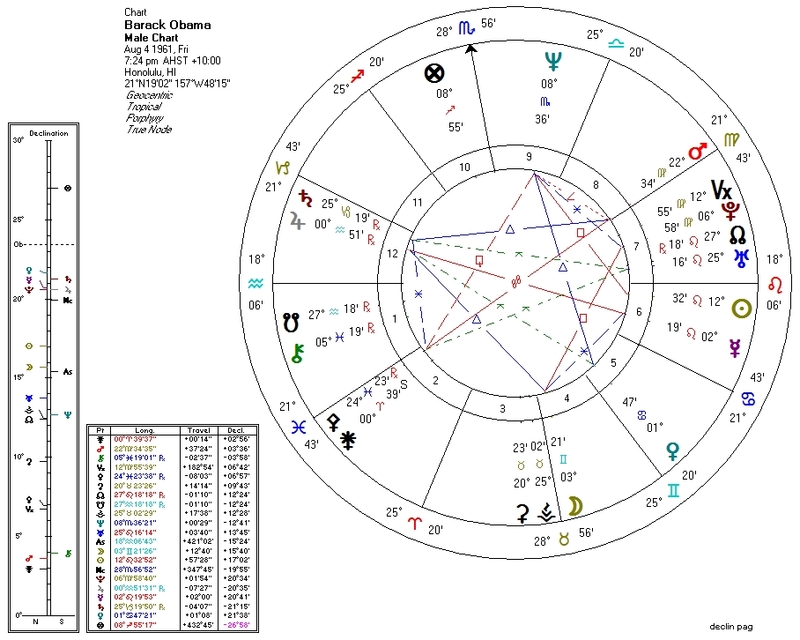 Along with Avakian's, Obama's chart has other features also common to mass-murderers: Pluto is connected to the Sun, the Moon, and Venus. Pluto is tightly parallel Mercury which rules the Sun, and square the Moon which rules Venus. Avakian has probably not murdered anyone. Obama will have murdered approximately a million human beings by the time he leaves office. The Left-wing indicators on Obama's chart are very strong. Suggesting cultural liberalism, Neptune is trine Venus, ruler of the Fourth House. His economics may be reflected in the chart by Venus trine Neptune and South Node, and Second House co-ruled by Jupiter which is square Neptune. Were Obama the leader of a less conservative regime than America, we might expect extreme Leftist tendencies to be even more apparent than they are now. A few more features stand out. The elevated Neptune square his Sun describes Obama's ability to dazzle the mass consciousness, employ his persona as a blank slate onto which people project their hopes and dreams, and deceive vast numbers of people about his true nature. The North Node conjunct Uranus is something he shares with his two predecessors to the throne: perhaps this shows a willingness to act without regard to consequences. The North Node is also in the Seventh House, and conjunct Pluto, hinting that he may be controlled by unseen corporate/banking powers. The South Node conjunct Chiron in the First House suggests that healing may once have been part of his agenda, but likely is no more. Pluto is square the Moon which rules Venus: Pluto connected with both goddesses is ubiquitous in the charts of those with feminist leanings. Conservatives would probably agree with that diagnosis in this case. Of course, not all of the thousands of persons with extremely similar astrological charts are going to be the sort of menace that Obama has proven to be. Many will have grown up under more positive circumstances and had better role models. Most will not have the opportunity to wreak quite as much destruction, as they will not ascend to the throne of the Empire. They will be good, productive citizens by virtue of the fact that outside of the plague of politics (which rewards greed, stupidity, and deception), goodness and productivity are the best way to get ahead in any market economy and peaceful society.